What’s Causing Colony Collapse Disorder? What is Colony Collapse Disorder (CCD)? 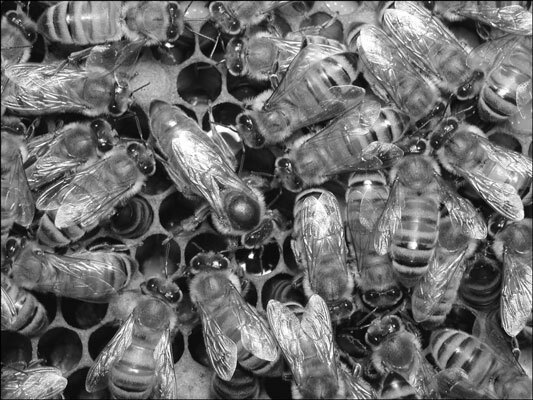 Three different castes (worker, queen, and drone) make up the total population of a bee hive. Each has its own characteristics, roles, and responsibilities. 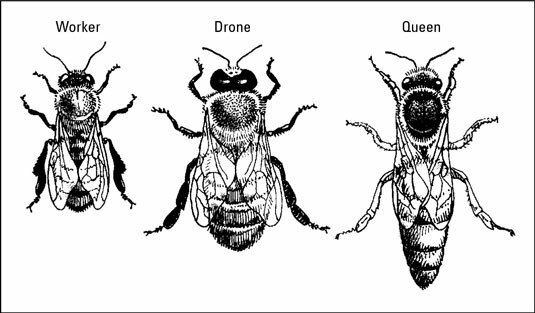 Upon closer examination, the three types of bees even look a little different, and being able to distinguish one from the other is important (see Figure 2-5). Let there be no mistake about it — the queen bee is the heart and soul of the colony. She is the reason for nearly everything the rest of the colony does. The queen is the only bee without which the rest of the colony cannot survive. Without her, your hive is sunk. A good quality queen means a strong and productive hive. Only one queen lives in a given hive. She is the largest bee in the colony, with a long and graceful body. She is the only female with fully developed ovaries. The queen’s two primary purposes are to produce chemical scents that help regulate the unity of the colony and to lay eggs — and lots of them. She is capable of producing more than 1,500 eggs a day at 30-second intervals. That many eggs are more than her body weight! A queen bee and her accommodating attendants. The majority of the hive’s population consists of worker bees. Like the queen, worker bees are all female. Workers are smaller than the queen, their abdomens are shorter, and on their hind legs they possess pollen baskets, which are used to tote pollen back from the field. Like the queen, the worker bee has a stinger. But her stinger is not a smooth syringe like the queen’s. It has a barb on the end. The barb causes the stinger, venom sack, and a large part of the bee’s gut to remain in a human victim. Only in mammals does the bee’s stinger get stuck. The bee can sting other insects again and again while defending its home. The only male bee in the colony, drones make up a relatively small percentage of the hive’s total population. At the peak of the season their numbers may be only in the hundreds. You rarely find more than a thousand. New beekeepers often mistake a drone for the queen, because he is larger and stouter than a worker bee. But his shape is in fact more like a barrel (the queen’s shape is thinner, more delicate and tapered). The drone’s eyes are huge and seem to cover his entire head. He doesn’t forage for food from flowers, and he has no pollen baskets. He doesn’t help with the building of comb, because he has no wax-producing glands. Nor can the drone bee help defend the hive — he has no stinger and can be handled by the beekeeper with absolute confidence. An organ inside the queen called the “spermatheca” is the receptacle for the sperm. The queen will mate with several drones during her nuptial flight. After mating with the queen, the drone’s most personal apparatus is torn away, and it falls to its death.